After a massive year for Wara which saw the release of their genre-defying debut album 'Leave To Remain' to great acclaim, including a 4-star review in The Guardian, a fantastic La Linea sponsored tour taking in Brighton and Hay festivals amongst seven UK-wide dates, numerous festival appearances, notably Glastonbury and Secret Garden Party, and a sold-out show at London's Jazz Café, it's a time for a celebration as Movimientos presents the official music video launch party for "Leave To Remain", the title track from their album, at The Forge in Camden on Thursday, 12 December. The London-based nine-piece band are a hot melting pot of identities with backgrounds that span the world map: Cuba, Argentina, Venezuela, Chile, Ghana,Congo, Spain, Italy and the UK. 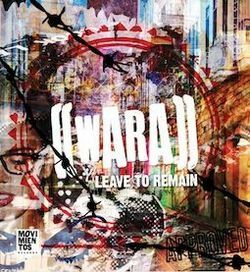 Wara formed in 2009 and soon found that they were doing what no one else was: namely portraying what Latin Americans face when moving to UK, using the music to bend stereotypes, genres and combine stories. "We reinterpret what has already been done [in Cuban music] so it applies to young people living here in the UK in 2013," says Latina powerhouse Eliane Correa, MD and keyboard player. The rest of the line-up includes Congolese-Argentinean lead vocalist Juanita Euka (niece of legendary Congolese musician Franco), London's Josh Solnick aka MC Murmur (from London's Afro Dub hip-hop crew FUR) as multiple-personality lyricist. Add to this Afro-Cuban songstress Nana Aldrin Quaye on backing vocals, Gabriele Greco from Italy on bass and Taurean Antoine-Chagar getting soulful on the saxophone. The rhythm section is held down by Venezuelan Ernesto Marichales tight on percussion, and Chilean Leandro 'Lele' Mancini on drums. Greg Sanders-Gallego plays guitar, his West African inspired riffs adding another geographical twist to the Wara sound. The songs which effortlessly combine Cuba's most danceable rhythms and styles – Timba, Salsa, Cha-Cha- Cha, Rumba - with contemporary urban elements such as Reggae, Soul, Hip-Hop and Jazz, are threaded with bilingual, conscious lyrics that inject social and political commentary into their music in a variety of ways including songs that directly touch upon the topics of migration, identity and displacement. It's been a whirlwind 2013 for WARA, London's young Latin music revolutionaries, and now the band are excited to play their final gig of the year to coincide with the launch of their first music video. Come and join the celebration for this flourishing band, as we look forward to another great year in 2014! On the night the band will be supported by up-and-coming Afro-Latin funksters Animanz with Movimientos DJs joining the dots between Cuban beats and sounds from the Latin underground.